Def Leppard will play a private show on 29th October in Las Vegas at the McAfee Focus 14 security conference according to the companies event website. The private show is listed as taking place at The Joint at the Hard Rock Hotel between 7-11pm on Wednesday 29th October. 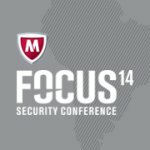 The event is for "registered FOCUS 14 attendees only". It marks the first time the band will have been back to Las Vegas and the scene of the VIVA! Hysteria residency since April 2013. As mentioned by Joe on 22nd July the proposed VIVA! Pyromania residency is not due to take place until at least late 2015. The FOCUS 14 special event will be held on the final evening (Wednesday) this year and promises to give attendees the perfect opportunity to unwind after an information-packed conference. Join us for delicious food and beverages and be treated to a private*, live music concert by Def Leppard. With 100 million records sold worldwide and two prestigious Diamond Awards to their credit, Def Leppard continues to be one of the most important forces in rock music. Their repertoire of hit songs includes "Pour Some Sugar on Me", "Photograph", "Rock of Ages", "Love Bites", "Hysteria", and more! Don't miss our sensational final evening festivities! *This event is private and for registered FOCUS 14 attendees only.